Carmia N. Caesar serves as Howard’s Director of Experiential Learning. Professor Caesar has spent the majority of her practice in small, non-profit legal offices that represent indigent clients. Her areas of practice include domestic violence, housing, and children’s advocacy. 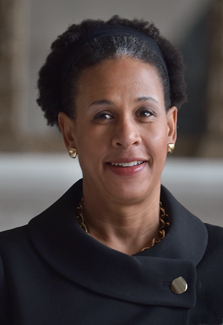 Prior to returning to academic administration she was the senior attorney in the TeamChild Juvenile Justice Project at the Center for Children’s Advocacy (CCA) in Hartford, CT. TeamChild models focus on providing educational and mental health advocacy to children involved with the juvenile justice programs. Professor Caesar worked in partnership with juvenile public defenders in Hartford to fill gaps in services that were often the underlying cause of illegal conduct. In addition to representing individual clients at CCA, Professor Caesar was engaged in systemic advocacy on behalf of Hartford public school students, and students incarcerated at the Manson Youth Institute, the CT prison that houses children charged or convicted of adult and Serious Juvenile Offenses. In partnership with the Education Unit at New Haven Legal Aid, she helped correct a system wide policy of unlawful withdrawal of children over 17 from the New Haven Public Schools. From 1996-2002, Professor Caesar served as the co-director of the Berkeley Village Educational Project, a community based, non-profit youth organization she co-founded with her husband, that provided mentoring, teaching and tutoring to at-risk, minority middle school students. Professor Caesar is a graduate of Pomona College and the Harvard Law School. Immediately following law school, Professor Caesar accepted a graduate fellowship in public affairs with the San Francisco Office of the Coro Foundation.